We are in need of individuals who enjoy being in an outdoor but shaded setting and are able to walk, with a few short intermittent jogs, for an hour (or more if you like!). This opportunity would best suit people who have an interest in working with youth and/or horses. 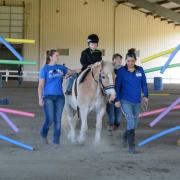 Each rider can require up to 3 volunteers depending on the nature of their disability. Horse experience is great but NOT required! Orientation and training is provided. During our 9 week session we have different volunteer times available each day but we need people to sign up to come at the same time on the same day each week (as much as possible) so the riders experience continuity. Mandatory new volunteer orientation will be the later part of Januaryand we will start the session the first week of February!